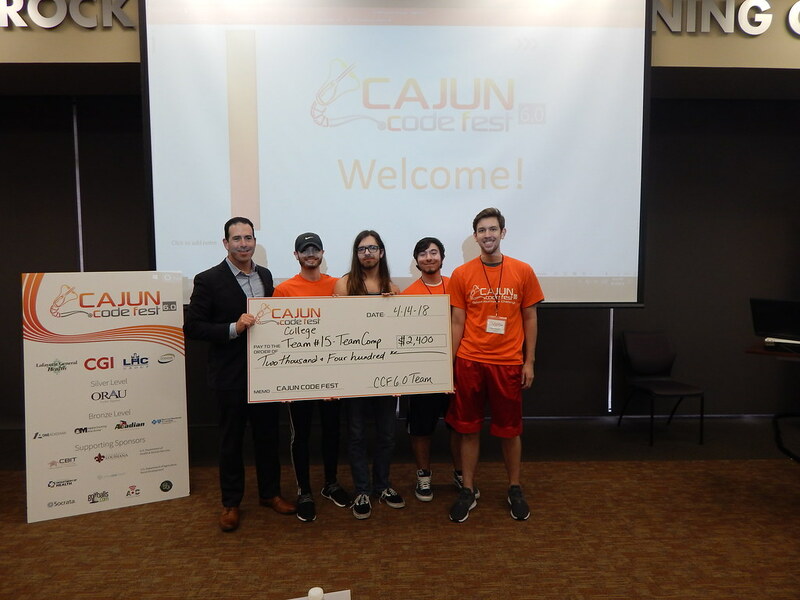 CajunCodeFest is once again tapping into Acadiana’s young, innovative talent to solve some of the nation’s most complicated issues. Now in its sixth year, the code-a-thon challenge and its affiliated healthcare summit focused on the country’s growing opioid crisis. For the Opioid Challenge, the University of Louisiana at Lafayette's Center for Business & Information Technologies recruited students — both K-12 and college — and professionals who were looking to build and present problem-solving applications related to the issue. The competitors attended the Coding Kickoff ceremony on Friday, April 13, where health data sets were finally made available. In total, there were 125 developers and innovators, or 20 teams: nine K-12 teams, six University teams, and five professional teams. The groups had about 24 hours to develop an app or tool that could affectively explore issues related to the epidemic’s usage, treatment and prevention. Once the competition concluded the following day at noon, the teams presented their solutions to a nine-judge panel, composed of governmental agencies, private healthcare providers, software companies, academia, nonprofit research organizations, and healthcare payers. The apps and tools were judged on their fit to the theme, the creativity behind the solution, the user experience they offered, and whether it was likely to be sustained because it could provide a clear benefit to the stakeholders. Winners were announced Saturday afternoon. Team “myPillz” from Ovey Comeaux High School in Lafayette took home the number one prize of “Best Overall,” while also managing to win the “Best K-12 Team” category. Team members included: Prachi Rajiwadia, Thomas Nguyen, Noah Karavatakis, Cha’Kerra Lewis, and Jesse Breeland. Team mentors were Mike Davis and Lisa Ranney. The app that the team developed connects to the National Drug Code Directory, which would help a user track his or her prescription drug usage. The real-time tracker flags opioid pills for user attention and offers guidance on proper dosage frequencies to avoid possible substance addiction. The streamlined user interface focuses on patient use and also addresses the needs of patients who get prescriptions from multiple doctors who do not cross communicate. The app could be extended to feed patient prescription data directly to doctors for reference during patient appointments. Team “const bool winner = true” also won the “Team Favorite” category. In addition to the code-a-thon, CajunCodeFest hosted its Opioid Healthcare Summit for local medical professionals and community members who were interested in joining in on the discussion. The summit, which also took place on Friday, brought together thought-leaders from federal and state levels who provided updates on initiatives, policies, and best-practices to address the issue. The morning session’s panelists included U.S. Sen. Bill Cassidy, R-La. ; Dr. Carrie Castille, state director for the U.S. Department of Agriculture Rural Development for Louisiana; Dr. Rebekah Gee, secretary of the Louisiana Department of Health; Dr. William “Beau” Clark, coroner for East Baton Rouge; and Bruce Greenstein, chief technology officer for the U.S. Department of Health and Human Services. Presentations were also made by the event’s sponsors: Lafayette General Health, CGI Federal, and Blue Cross Blue Shield of Louisiana. The afternoon session, a roundtable hosted by USDA and moderated by State Senator Fred Mills, Jr., focused on prevention, treatment and recovery. Audience members heard from various platforms that included legal, legislative, and medical. Jennifer Holmes, a licensed clinical social worker who specializes her practice in assisting individuals with substance use, addiction and recovery issues, addressed the issue from a unique perspective, as a person in long-term recovery, herself. In addition, other roundtable panelists included: 21st Judicial District Judge Blair Edwards, who works with the juvenile drug court in Tangipahoa, St. Helena and Livingston parishes; Dr. Vincent Culotta, Jr., chief obstetrics and gynecology at East Jefferson General Hospital; Karen Stubbs, assistant secretary for the Office of Behavioral Health at LDH; Randy Henagan, criminal fraud investigator for the Louisiana Attorney General’s office; Lee Jones, assistant state director for USDA Rural Development in Louisiana; and Dr. Estaban Gershanik, director of the Bureau of Health Informatics for the Office of Public Health in Louisiana. Summit goers and competition coders were presented with the event’s tradition of crawfish boil at Abdalla Hall on Friday evening to kickoff the weekend’s events. (Pictured from left to right) Congressman Clay Higgins, Dr. Carrie Castille, State Director, U.S. Department of Agriculture Rural Development, Prachi Rajiwadia (front), Thomas Nguyen (back), Noah Karavatakis, Mike Davis (Team Mentor) Lisa Ranney (Team Mentor) Matt Delcambre, Director, Center for Business & Information Technologies, Bruce Greenstein, Chief Technology Officer, U.S. Department of Health and Human Services. Team Members Not Pictured: Jesse Breeland and Cha’Kerra Lewis.